Workforce evolution has seen an increase in the number of contract and part-time positions in recent years. Yet contractors and part-timers can hang on the peripheries of a team’s core if they’re not carefully integrated — and that can mean lost opportunities for skills exchange, collaboration and contribution. It stands to reason that the better you get to know your temporary and part-time workers, the more you’ll gain from working with them. Of course, in some countries, such as the U.S., the legalities of contractor treatment can make deeper integration of temporary team members a minefield. So how can you ensure your team makes the most of contractor and part-time relationships? Your organizational and team culture will affect the way in which contractors are accepted. Culture can actually discourage contractor contributions, so it’s crucial that you’re conscious of cultural issues that might support or undermine the team-contractor relationship. Try to induct contractors effectively, so they understand the roles and responsibilities of their colleagues. Introduce contractors to those they’ll work with, and those they will be physically located near. Announce new contractors before they arrive: Send an email or message to your team to let it know the person’s name, project, task and contract duration. Invite staff members across your broader organization to introduce themselves if they encounter the contractor or part-time staff member, as a basic professional courtesy as well as an essential ingredient of a friendly company culture. Does the way your team operates support contractors and part-timers? Does it allow you to make the most of their contributions? You may need to revise processes or approaches to allow these team members to make their best contributions, perhaps scheduling team or progress meetings to fit part-time work agreements, or requiring contractors working on specific tasks to report back to the team on their progress. This can help the contractor or part-timer stay on track, as well as help other team members understand where these individuals’ contributions fit in. If your organization’s work documentation and processes are complex and formalized, or jargon-heavy, you may have difficulty getting those team members to adopt them. After all, since their time with your organization is limited, they won’t want to struggle with grasping and applying complex processes. So if you require contractors as well as permanent staff to use those processes (for reasons of regulatory compliance, for example), make sure those people understand the processes’ importance and relevance, as well as how to use them. You could also consider paying them for the time spent familiarizing themselves with complex processes. If it’s not immediately clear to contractors and part-timers which systems you use for what — and why — you might find yourself dealing with unnecessary confusion, frustration and stress. Especially in the case of part-timers, who may be working only occasionally on documents or systems with other full-time team members, work can easily be misplaced, overwritten or simply inaccessible when it’s needed. Make sure it’s clear which tool or system is used for what purpose, and provide that information in a centralized location so that those who aren’t working with those systems every day are able to refresh their memories whenever they need to. As you choose the tools and systems your team will use to collaborate with contract and part-time team members, don’t neglect to consider security issues. You may not want to provide contractors with access to data related to any projects other than the one they’re working on, for example, and you probably want to revoke that access when their contracts end. Also remember that using widely-available tools wherever you can may reduce the learning curve (and time cost) faced by contractors trying to make valuable, often specialized, short-term contributions. The more proprietary, purpose-built tools you use, the more time and money you’ll spend educating contractors to use them. Finally, remember that the tax and employment law regarding contractors may affect your ability to integrate such workers. In general, firms that exercise too much control over a worker may run the risk that the contractor will be recharacterized as an employee. These legal issues need to be balanced against making contractors part of the firm’s culture. Teams that have a friendly culture, simple processes, and appropriate, practical toolsets are best positioned to make the most of contractor and part-time worker engagements. If you’ve found other factors to influence the value of these relationships, we’d love to hear them. Photo courtesy stock.xchng user jnphoto. Thanks for the thoughtful comments. It’s interesting to have such strong feedback on this topic. I think it’s an issue, but one that’s not often discussed openly, perhaps because to raise it as an outsider seems somehow impolite, and insiders often fail to realize what they’re missing out on by keeping contractors and temps on the perimeter. Great blog!! It’s a must to get to know and utilize your temporary and part time workers. You want your temps and part timers to feel comfortable. I’ve held many jobs over the years: full-time, part-time, Consultant… the hardest thing with starting a new job is fitting in – and doing it fast, so as to add value as soon as possible and prove ones worth. When you’re hired as a full-time staffer, your instantly viewed as part of the tribe, and integration happens… no matter how disorganized the organization is. Part-timers & consultants don’t get the same embrace. 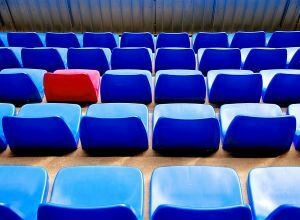 You’re always a partial outsider because in reality you either have a foot out the door (consultant) or the company hasn’t committed to you for the longterm (part-timer), so why should a company’s employees spend energy bonding with you (you’re a tourist or hired gun after all, right?). That said good processes and collaboration tools are key to helping cement a team and are essential for people that fall outside the traditional tribe of fulltime onsite staffers (let’s call them semi-insiders). Semi-insiders often struggle with integration because they are frequently siloed. The reasons are simple: “Your time is finite or our budget is finite so just do these things – don’t worry about other stuff happening outside your direct field of vision.” What this creates is a lack visibility into other areas of the organization. How can a semi-insider be of greater value when they are forced to wear blinders? This need not be so. Our tools should be able to compensate for this. Just my opinion! Something I think our company Cohuman is seeking to redress (among other things). Georgina you’re tackling a relevant topic that got me musing and rambling! This is an issue that will only become larger over time and worthy of more discussion. Spot on, just quit a gig because this had stopped.